This text is part of the New Studies in Constructive Theology series. It asks critical questions about the divine action in the world, addressing such issues as miraculous events. Recent work in cosmology, quantum physics and the brain sciences offers opening for a theology of divine action. This is a systematic survey of the relationship between natural science and theology. - Publisher In a discipline which is growing weary of critical analysis, this series returns to the original texts & surveys the classic works in theology, relating past thought with areas of contemporary concern in an innovative & constructive way. 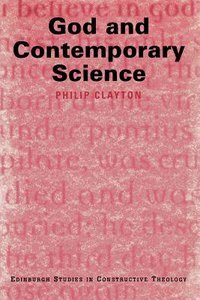 About "God and Contemporary Science"
In a discipline which is growing weary of critical analysis, this series returns to the original texts & surveys the classic works in theology, relating past thought with areas of contemporary concern in an innovative & constructive way. Philip Clayton is Ingraham (M.A., M.Phil., Ph.D., Yale University) is Professor of Theology at the Claremont School of Theology and professor of philosophy and religion at Claremont Graduate University in Claremont, California. He is also the author of Explanation from Physics to Philosophy: An Essay in Rationality and Religion (Yale) and the Templeton Prize,winning book God and Contemporary Science (Eerdmans).Dr. Clayton's quest is to develop a constructive Christian theology in dialogue with metaphysics, modern philosophy, and science. The demands of this task have led to his work and publications in the theory of knowledge; the history of philosophy and theology; the philosophy of science; physics, evolutionary biology and the neurosciences; comparative theology; and constructive metaphysics. A panentheist, he defends a form of process theology that is hypothetical, dialogical and pluralistic as evident in the edited work In Whom We Live and Move and Have Our Being: Panentheistic Reflections on God's Presence in a Scientific World and The Problem of God in Modern Thought . Understanding Human And Divine Agency.